As a much younger man, I adored the “Choose-Your-Own-Adventure” books, but what really caught my attention was the “Fighting Fantasy” series. It used stats like Hit Points and Attack Dice, so it took the experience a little further. It was what truly fostered my love of RPGs, as I found these books right around the same time I found Dragon Warrior 1. These two forces combined, and I was hooked forever. Being able to absorb myself into a small novel that I flipped around in, fought bad guys and collected treasure? That was probably the greatest thing for me. So when I heard that the Fighting Fantasy books were coming to a video game format (mobile and Steam), that made me ridiculously happy. In fact, I did an interview with one of the members of the team putting it together. There’s not a lot of dialogue. You have to figure it all out. Fighting Fantasy Legends takes place in the world of Titan, where a majority of the books took place. 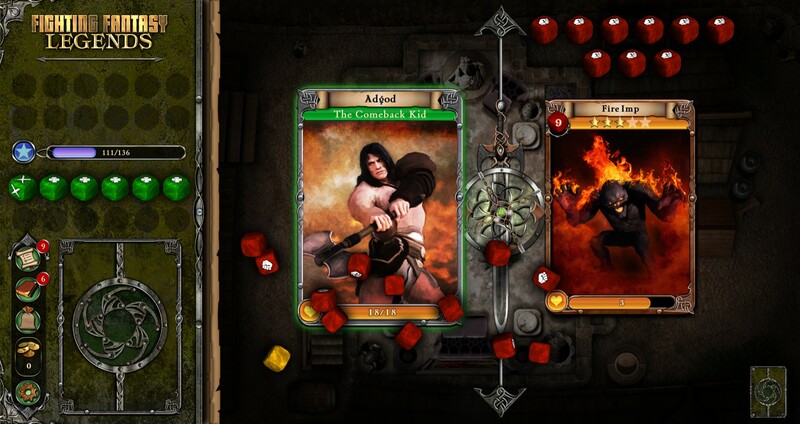 This game is set across the events of The Warlock of Firetop Mountain, City of Thieves, and Citadel of Chaos. I read at least one of those three as a lad, but I did not remember any of the content within, so it still felt like a nice, fresh adventure. I don’t think it would matter either way because it’s not just City of Thieves, it’s the other two books at the same time! So, let’s delve into how this works. Nomad Games put a lot of work into this, and kudos to them for it. Starting the game is very simple: you choose a difficulty (only Adventurer at the start; you can unlock Hero/Legend later), then you pick your avatar: Dwarf, Barbarian, Elf. I’ve never understood why games use races as character classes, but here we are. Then you choose a name from a list. You don’t get to write your own name in. It doesn’t matter which you pick because you customize what you want in terms of stats and special skill. You have plenty of options for character creation though. 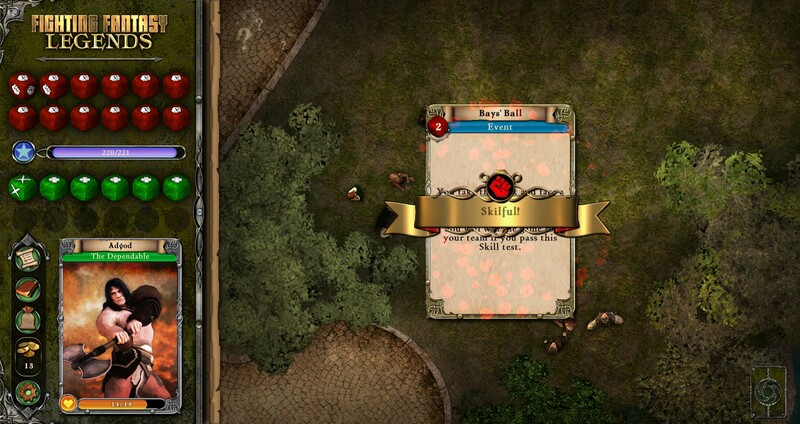 You have SKILL which represents your expertise in combat, and represents how many attack dice you start off with. LUCK is … well, how lucky you are, and how you deal with luck-based challenges and how many dice you have to deal with them. 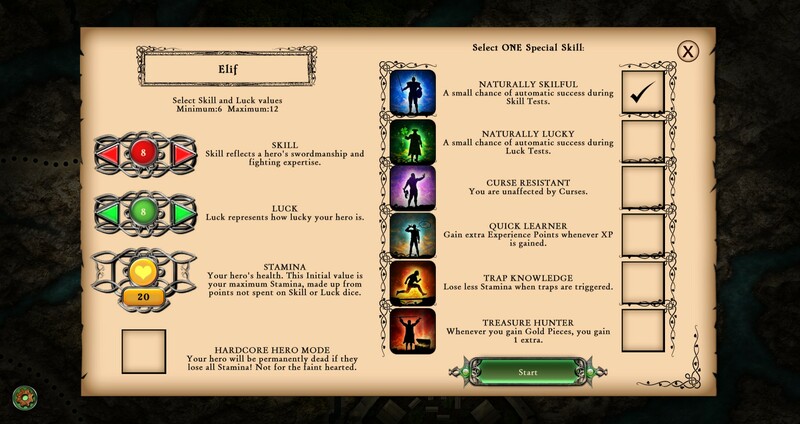 Then you have special skills, from which you can select one. Everything from “More EXP”, “1 more gold piece every time you find gold”, “Unaffected by Curses” (which in hindsight, I should have used instead of EXP) and a few others. They aren’t major boosts to the character, but they are helpful, so take whichever you feel will benefit you the most. You start with 8 points in each stat and 20 HP, but adding to your pool of Attack/Luck Dice will detract from your total Stamina. You can cap those dice at 12, which gives you 12 stamina. That’s … very dangerous, I recommend against it. Personally, I capped my Damage Dice, but took away from my Luck dice, because I never won those in earlier attempts anyway. More on that in a bit. You don’t start off with any real direction other than being told to “Go to Port Blacksand” to talk to a Wizard. Nicodemus the Wizard will help you get started on your quest. You’re going to get a lot of Quests throughout your journey, but you have to find your own way. There’s no minimap, no real direction. You just have to explore. 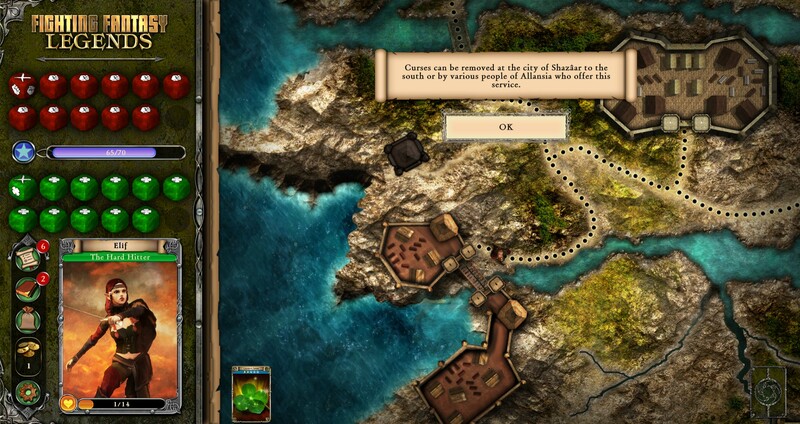 Exploring a town like Blacksand can be incredibly frustrating though. You cannot backtrack. Did you accidentally click on the wrong street, or go down an alley to find what you’re seeking isn’t there? You have to continue moving forward through town, leave town, and come back in and do it all over again. This became infuriating to me until I found that I can use this to level my character, increasing the power of my dice and farm gold through events that always happen. In the streets, you’ll see glittering spots with a Question Mark, which trigger random events drawn from a deck. They could be great for you, or they could be a cursed item or a plethora of other things. But there are events that always happen in town, like encounters in abandoned houses, or a group of children playing stickball. If you pay attention where these are, and you win the skill challenges, you can rack up some serious gold – and you’re going to need it. This is a city that is incredibly treacherous, and without spoiling anything, I will warn you of this: Be cautious. Be very cautious. You have many options on how to proceed, whether you just fight the guards and make your way into the city, or try guile. I’ll leave the story at that because that’s where it begins; but you’re in for a long journey, and one worth undertaking. One of the rare checks I passed. Each of your dice has one Fist or one Clover on it, representing Skill and Luck respectively. That means you have one chance per die for each encounter, and challenges will take various amounts of the die. I’ll tell you honestly that I failed every single Luck challenge until I found an item that guaranteed I’d win them. When you level though, you can add a point to one of these die, making it a little better each time. So you probably do want to spend some time fighting lots of enemies or completing challenges to increase your power. Combat takes this same approach. You and the enemy have X Hit Points/Stamina, and you roll all of your Skill dice, and the enemy rolls all of theirs. Any “Fists” mean you take one damage, and the same goes for the enemy. There are some instances where enemies will deal double damage though. There are occasional items you can throw for damage, like Throwing Daggers. More often than not I just… had to stay cursed. Should you die (and you will, pretty often at the start), you land outside of Port Blacksand, with 1 hp. Both of your die take a penalty (like a curse) which places an X on your die, and if you land on those X marks, it counts as a miss. 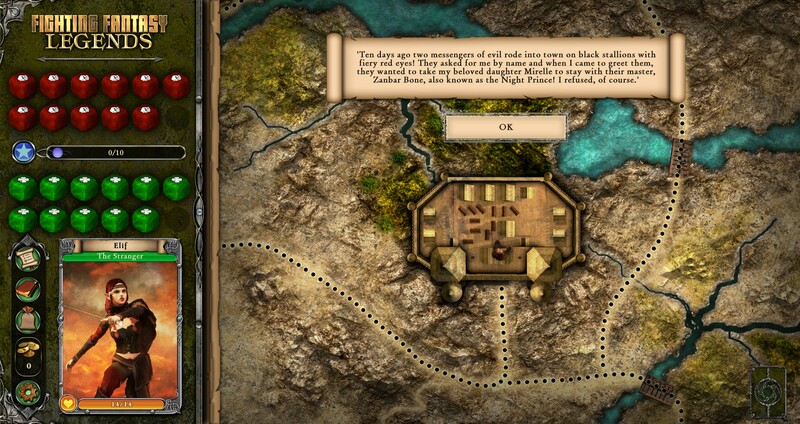 You can restore the penalty by resting in an inn in a town, and you can remove curses from Luck dice from a Fortune Teller. This can be a definite drawback if you lose all of your gold to thieves, or have to buy items. More than once, I was stuck with 1 hp, because I had no gold. I’d go into town and try and find a way to make some cash, or make it to one of the skill challenges, only to die again, receive another penalty, and be set back even further. I recovered, but it took a few runs of town, and it was frustrating, because there are a lot of fights, even in Port Blacksand. So be aware that you can be slowed down pretty easy. In spite of this, it’s incredibly fun, and it’s a faithful adaptation of these books. 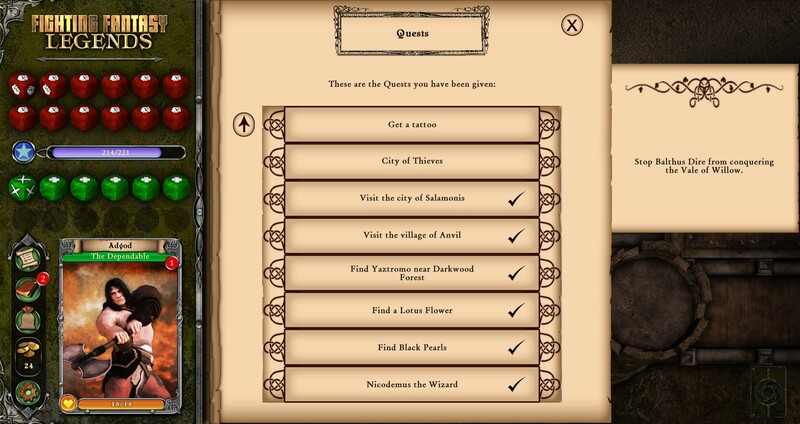 You’ll spend a lot of time wandering, trying to remember where things are, completing quests, and resting. It’s not going to be a game you are likely to complete in one sitting. It’s got challenge, which might feel unfair sometimes. But that’s how the books were! It’s incredibly accurate in this way. 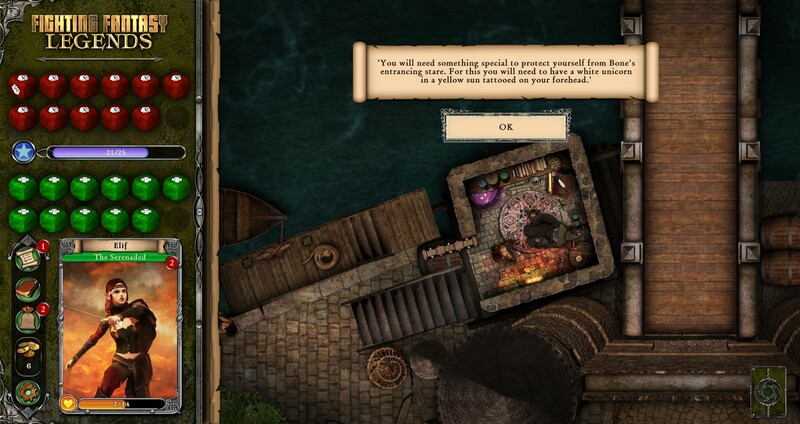 Fighting Fantasy Legends is probably Nomad Games’ best work. It’s a thorough recreation of the Fighting Fantasy franchise, lovingly crafted, keeping the same charm and insane difficulty the original works had. However, there are a few things that really hold it back. For a game that’s based on books, there’s surprisingly little dialogue, and the dialogue that’s there is pretty simplistic. I was hoping for a bit of conversation, or some manner of communication in the game. I wasn’t expecting voice acting but I did expect more. Beyond this, the mechanic of removing curses from your Luck Dice are very expensive at 10 gold. Healing and removing damage from your Skill dice is only 1 gold, but Luck dice costs far more and you have to survive a trip through town to do so, hoping you don’t lose even more on your Luck dice. And if you have cursed items, that means you have to spend even more gold. That kind of imbalance really frustrated me, but the excellent gameplay and exploration made up for it. Other than those minor frustrations, the game is wonderful. It is a game that you will die in (a lot). The incredible difficulty seems to be popular these days, so I think fans of challenging RPGs that have never heard of the Fighting Fantasy franchise will get just as much out of it, as the long-time fans looking for in-jokes and easter eggs (they’re there)! I do hope to see more of these, in the form of expansions, DLC, or being able to make your own adventures for your friends to tackle.